She has got more pairs than I and she is only two! Imagine how many pairs she will have once she becomes a teenager? But I do not spoil my daughter. We only buy her a pair of shoes when it is really time to buy a pair, like when the sole is already worn out or when the shoe no longer fits into her dainty little feet. And my, how quickly she outgrows her shoes. I am just glad though that she has girl friends... and that means, lots of hand me down shoes for her to wear in the years to come. Hihi! This is the first ever pair that she has. 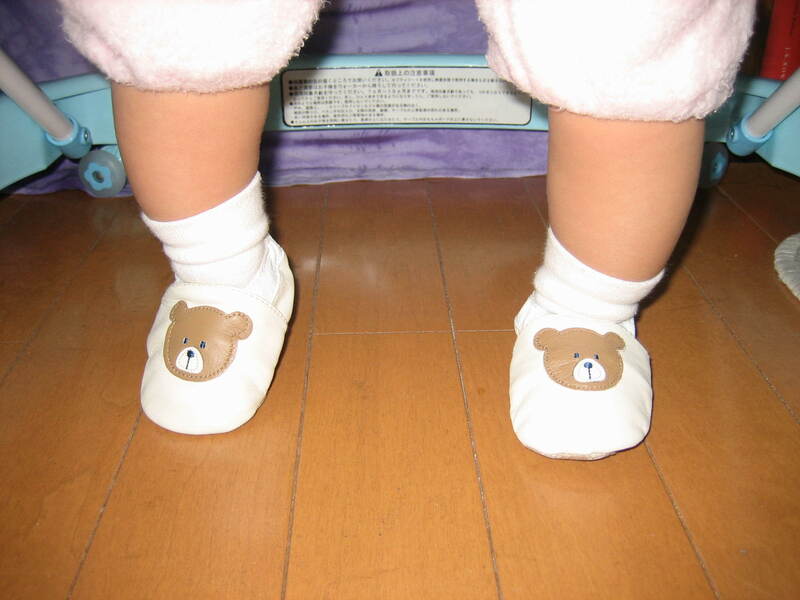 I just love these teddy bear shoes. She was just learning how to walk then and she hates it when I put something onto her feet. Then there's these navy blue BabyGap ballerina/baby doll shoes that I really love because she looks so much like a small school girl. Then her other pairs follow. 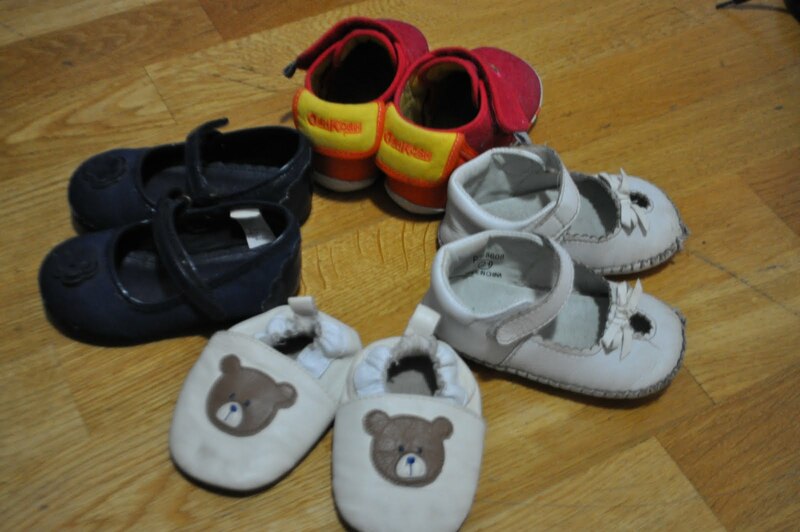 The red Osh Kosh pair was a gift from her Ninang Jo last Christmas 2007. The white Pitter Pat pair were her Christening shoes and has been overused since then... she just loves to wear this pair most probably because it has a very soft sole. The two mid cut leather shoes are the two most recently used pairs. She is now a 23 (Europe size). The ballerina shoes are her house shoes. She loves to run around the house and in the balcony and the floor could get so cold so I make sure she wears them. The green rain boots were given by our friend here and used to belong to her grandchild. The rain boots were perfect for playing in the snow. 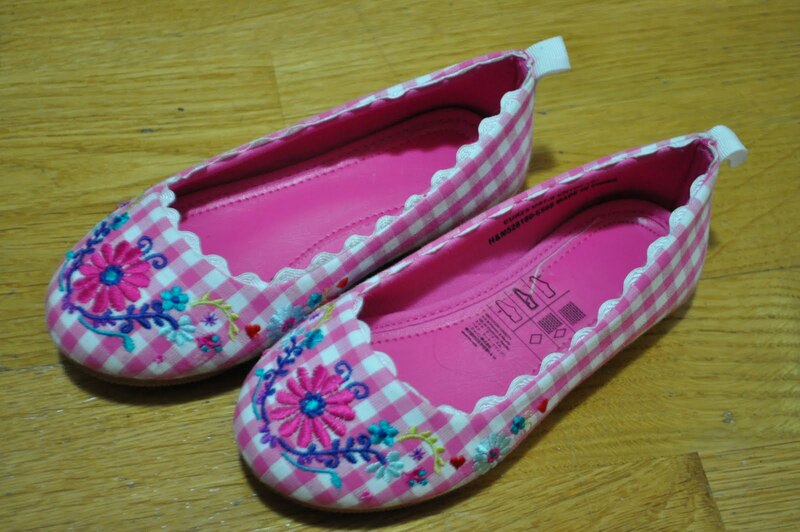 Then there's the checker stripes pink flat slip on shoes, which is a size 25. I recently bought this pair because I so totally love the color and the design. It is just so girly! I know that come summer, this pair will perfectly fit my little daughter's feet! I just love it every time she says "Shooossh" with matching pouting lips... that means she wants to wear her shoes or when she's wearing them, that she wants them removed. She also tries on her old pairs sometimes. She gets frustrated when she finds out they won't fit anymore! Hihi! How about you mommy? What's your little one's favorite pair? Wow! Dami shoes nila. Coolness!! By the way, I have mine up na rin at www.MommyRubz.com Hope you can visit some time. Thanks!! Oh your little princess is adorable!! Kawaiii! !Pag babae ang anak,di nawawala ang pink shoes kasi they're really cute naman lalo na with those lil feet ni Sam! Lots of shoes, and they're all so nice. I love the blue ballerina shoes, really cute! I hope you can visit my entry, too. Wow like all of it but the last pic is cute...happy mommy Moments. Pink seemed to be a favorite color for girls. Colorful! Happy MM! awww she's so fashionista :) love her shoes! i love the pink one with hearts, so lovely. kasya ba sakin un? hehe! Super cute naman ng mga shoes ni Sam! Am a little late for my entry, but here is their shoes.. then and now, hope to see you and have a great weekend! anong daming shoes nyan, nasusuot ba lahat yan? wala akong entry, di ko napicturan mga shoes ng mga kiddos ko.. These are cute little shoes for baby sam. she is so cute. awww.. aren't kids' shoes simply adorable?? ang kucuuuuuute! sobra. Wow, ka Imeldific naman ,,, heheheh so cute! 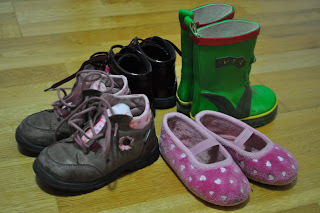 my kids at that age naku, gusto lahat pink, pero ngayon, black chucks na haha.. dami niya shoes... but i like pink the most. aww.. i love the first picture! it just brings back memories, di ba?